BRUCE J. ROBERTS M.D., F.A.C.O.G. M TODD RUK M.D., F.A.C.O.G. GARRETT H. GARNER M.D., F.A.C.O.G. KRISTI L. RYDER M.D., F.A.C.O.G. COURTNEY G. TRYLOVICH M.D., F.A.C.O.G. Contraception is any method of birth control used to prevent pregnancy. A woman has many birth control options; which are appropriate depend on her age, overall health and lifestyle. Contraception can be permanent or temporary. Some types of contraception are more effective than others, and it is up to each woman to decide which type is right for her. During a woman's monthly cycle, the ovaries produce an egg that moves through the fallopian tubes into the uterus. When an active sperm reaches and fertilizes the egg, it attaches to the wall of the uterus and begins to develop. There are various methods of contraception that prevent pregnancy, some by changing the process of a woman's cycle, and some by ensuring that the sperm and egg do not meet. There are two basic types of contraception available. Some are available by prescription only, and others can be purchased over the counter, at a pharmacy. Condoms and sponges may be purchased over the counter, but diaphragms and cervical caps must be prescribed and fitted by a physician. Spermicide, a substance that kills sperm, can be used in conjunction with all barrier methods except the sponge, which already contains a spermicide. Hormonal methods of birth control are prescribed by a physician after a physical examination. The doctor determines which type of hormonal method of contraception is appropriate for each individual. 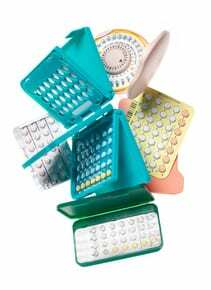 Birth control pills must be taken on a daily basis, or on a schedule determined by the physician. In order for birth control pills to be effective, they must be taken daily or as directed by a doctor. Other types of hormonal methods, such as a vaginal ring, implant or IUD, are surgically implanted into the woman's cervix or uterus, and release a steady stream of hormones. To be effective, both barrier and hormonal methods of contraception must be used consistently and correctly. In general, hormonal methods of birth control have more risks associated with them than barrier methods. It is important to note that condoms are the only method of contraception that provide protection against sexually transmitted diseases and HIV. Women who are older than 35 or who smoke have a much higher risk of heart attack or stroke when using hormonal birth control methods. Hormonal methods of birth control do not provide any protection against the HIV virus or sexually transmitted diseases. It is important to consider all risks inherent in a particular method of birth control before choosing it. No contraception method is 100 percent effective. Women should consult with their doctors about the different types of oral contraception available, and to get answers to any questions they may have about contraception and family planning.